From the Voice of San Diego Real Estate, If you read “ Getting Ready” in the previous article I posted here and have followed all the guidelines and precautions, you are now ready to begin the design and selection process. With all the choices in the market place, selecting the color scheme of wood tones , paint colors, floor finishes maybe even window coverings is your first step to complete the design. Assuming you now have that, what about the cabinets. There are as many different design and qualities as there are finishes, maybe more. What sort of feeling do you want and how have you budgeted for this most important element in the design? One of things to be aware of that while any new cabinet will look good for a while, what happens when they don’t. What happens to the finish and any broken parts. Store brands or off brands may not have the adds you you passed over for the immediate budget concerns . What is something gets damaged and you need to replace it. Will the brand still be around to help with the solution. Buying cabinets then not about buying from the cheapest source. It about being the best and that doesn’t mean the most expensive. 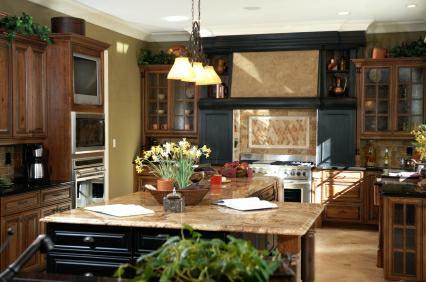 Know the sources for the best and most reliable cabinet companies. This is where that Kitchen designer comes in handy. They will most often know who has been around and who does or does not stand behind their warranty. A great warranty is only as good as the company that stands behind it. The BBB is also a great resource when doing any remodeling. What sort of surface do want. Almost the first words are granite. 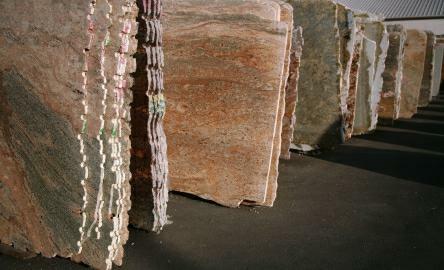 It is a solid stone that is quite pricey and when you find some at some unbelievable prices, you will believe the price better when the counter just ups and cracks. It is a natural product and that hairline fissure that made the price so affordable may just up and quit being a bargain and you will find yourself replacing the pieces. What other surfaces have you looked at. there are synthetic fabrications of marble and stone with resin or epoxy finishes. Some of these may change color on you depending on the light exposure and what gets on them. Formicas are reasonably durable but have a shelf life. That meaning that the colors and the textures go out of style but still may be an alternative in the short run. Corian and other synthetic fabrications may also be an acceptable alternative. Whatever the desired surface there are plenty to choose from. 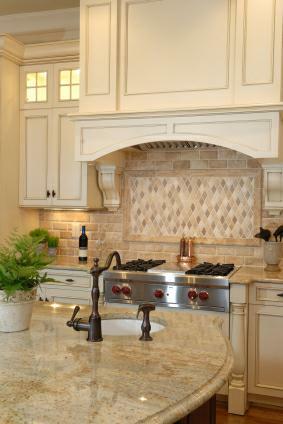 Another way to purchase granite is as tile. It is much less expensive, just as durable but just like with tile, you will have grout and the potential for staining and needing to redress that eventually. One of the main benefits of the continuous slab is that there is grout and the surface is smooth and easy to clean. What ever you choose, just be aware of the many different fabrications available and the differing prices depending on quality. To create the aesthetically pleasing Kitchen, the recessed ambient lighting is one of the most cost effective ways to update your home. No longer is it necessary to have to determine this for your self. Lighting designers will help you and are skilled at creating the scale and the balance needed to create the proper work light where it is needed and the specialized lighting that creates the ambient effects under cabinets, accenting any art work or just creating the overall mood. Refrigerator: The Selection of Appliances and some of the state of the art features that are available today are like having a computer in your your Kitchen. Filtered Water and ice dispensed from the refrigerator is certainly the minimum. How about an HDTV. Soon I expect we with have full computer systems built into the the door of the Refrigerator. Think not? Think again, the patent has already been applied for and granted. Double Ovens. Until I recently purchased my new stainless ovens, I didn’t realize that they come in sizes. I was limited to the size of my existing cabinets. Check this out , select what you want before doing the cabinets, otherwise you will be faced with a resolution and the cabinets installed usually win out. ( Unless you were smart enough to know this ahead of selecting and ordering cabinets). Dishwasher: So many styles to choose from but I rather like the drawer type with stainless inside also. Trash compactor, once you get used to using this appliance , it is hard to imagine not having one. The reason most people don’t like them is because the cheaper models are loud. The new better made models are not. 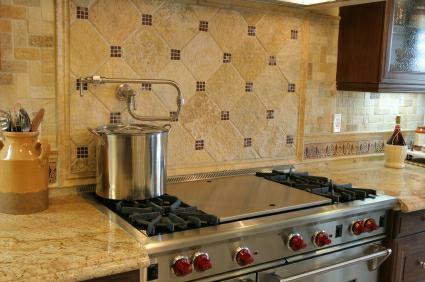 Stove Top: Many to choose from but the best is gas with special venting to draw down the steam,cooking odors,etc. In my post this morning about ” Getting Ready” , I should have also mentioned that this venting needs to be put in before the cabinets are finished. Otherwise, a lot of unneeded cutting and messing things up after the fact. The new stainless tops are pretty awesome. If your plan calls for a stove instead of just a cook top, there are many models to choose from and they can get pretty expensive. If you are the gourmet cook in the house , check out various features before you settle. Many people have the idea that everything should match. That may or may not be true if you have special needs. An expert in appliances would be glad to show you all the possibilities and then making those hard decisions will be a bit easier. The more you know, the better the decisions can be made. Microwave: If you can avoid it, watch out for plastic handles. They break and also break off. Select this item carefully. Plastic inserts in doors break and crack when the door gets accidentally slammed to hard. I haven’t checked but I would think that if the seals are broken, the microwaves may be escaping through the door. I suggest buying the Best you can afford in this appliance. If you want a built-in all one piece counter and sink, there are no edges nor any possibility of water getting between sink and counter. The only issue is, that you will be limited on size and functionality. The stainless sinks, if you are having stainless appliances can be beautiful. Porcelain sinks in white or colors coordinate with counters or other accent colors used. Divided sinks in my mind give more functionality than a larger single sink. If you have the room, get one as big as you need and as deep as possible ( especially if you have a larger family and your pots and pans are larger). 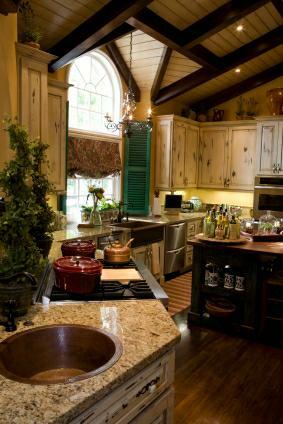 I like the vegetable sink and also the island sink as it supplies water for cooking and you don’t have to always be at the main sink. Remember, this requires extra water lines and they need to be installed before the counter. These two very important areas may require yet another consultation. This time with an Interior Designer. Plain walls and painted ceilings are fine. But even there, with the addition of crown moldings and wainscoting, the ordinary takes on an elegant transformation. Wood ceilings, with moldings or beams can add even greater dimension. Special Cabinet trim can be used to bridge area where there are no cabinets for concealed lighting , window coverings etc. A good designers consultation will give the Kitchen its final and best character. Don’t skip this part, it is essential for the best in transformations. The decorative applications, additions and elegant hardware for the cabinets can add yet another dimension, even to plain style cabinetry. Allow your imagination to soar! This entry was posted on Friday, May 9th, 2008 at 8:55 am	and is filed under San Diego Real Estate, San Diego Real Estate News, Selling San Diego Real Estate. You can follow any responses to this entry through the RSS 2.0 feed. Both comments and pings are currently closed.